This section is excerpted from our book Sew & Stitch Embroidery. Available for purchase here. Embroidery Needle: A hand sewing needle with a sharp point and a long eye to fit strands of embroidery floss or yarn. Embroidery Hoop: A wood or plastic hoop used to hold fabric taught while embroidering. Each hoop is sized by the hoop diameter (i.e. 8’’ or 10’’) and has an inner ring, outer ring, and a closure to secure the hoops and fabric in place. Embroidery Scissors: A small, high quality, scissors with a sharp point. Quilting weight cotton: A tightly woven fabric with a vertical and horizontal weave or grain lines. Quilting weight cotton can come in solid colors, plaids or printed patterns. I usually embroider on a light colored or solid colored quilting weight cotton fabric. 6-strand embroidery floss: Embroidery floss made up of 6 strands of loosely twisted thread. Embroidery floss is manufactured by several companies including DMC, Cosmo, Anchor, and Presencia and comes in hundreds of colors and styles. The most common style of floss is the 6-strand mercerized cotton embroidery floss. Mercerized cotton refers to the process the cotton floss goes through to give the cotton strength, luster, and the ability to better hold onto dye. The first step to embroidery is getting your design onto your fabric. This can be accomplished in several different ways depending on personal preference and the type of fabric you’re transferring your design to. Below are several ways to transfer your design to fabric. An iron-on transfer is a design that is commercially printed onto paper using a heat sensitive ink. It is printed in reverse and once it is transferred to fabric it appears in the correct direction. Ink is permanent and the transfer can be used about 5 times. Check out our embroidery patterns that include an iron-on transfer in our Stitch section. How to: Set your iron to no steam. Place paper on the ironing board to protect it from ink transfer. Lay your fabric on top of the paper. Pre-heat your fabric by ironing it for a few seconds. Place the iron-on transfer on top of the fabric with the transfer facing down against the fabric. Hold the iron on top of the transfer for about 10 seconds. Lift the iron up to press another section of the transfer. 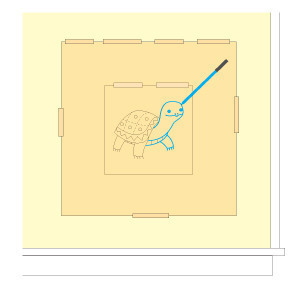 Avoid moving the iron around on top of the transfer because the transfer will move slightly and make your image blurry. Peek to see if it transferred all the way then remove transfer. This is my favorite and the most basic technique for transferring designs to fabric. It works best for light colored fabrics, non-stretchy fabrics and a simple design. How to: Tape your embroidery pattern to a bright window. Take your fabric and tape it to the window on top of the pattern. Try not to stretch the fabric. Trace the pattern directly to the fabric with a water soluble marker, a FriXion pen or even a sharp pencil. Using carbon or graphite transfer paper is another simple way to transfer your design to fabric. It’s reusable and a great option when transferring a Printable PDF embroidery pattern to your fabric. It comes in different colors, even white so you can use it on dark fabrics. This is my go to technique when a fabric is too difficult to trace through. How to: Lay your fabric on a hard surface. Lay your carbon or graphite transfer paper, carbon or graphite side down, onto the fabric. Place your design on top of the carbon or graphite transfer paper and fabric and pin through all the layers to hold your design in place. Using a dull pencil or metal stylus (I use my grandma’s tiny metal crochet hook), draw over your design with a firm and even pressure. 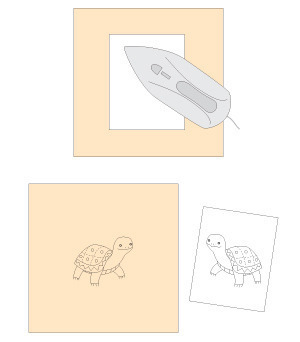 Peek under the transfer to see if your design is transferring properly. 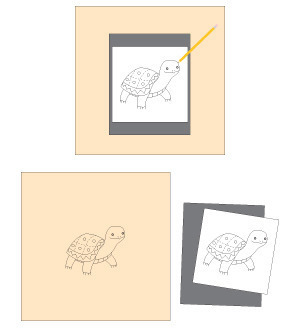 When finished drawing over the design, remove your pins, design, and carbon or graphite paper. 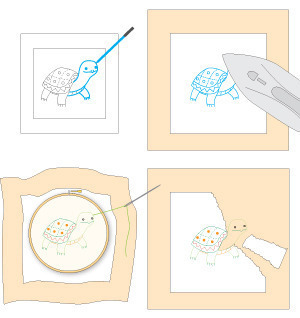 When working with a tricky fabric, like something that is thick and squishy like felt, loosely woven like burlap, or stretchy and knit like a tshirt, you can use an embroidery stabilizer as a transfer tool. Embroidery stabilizers are most commonly used on the back of fabric to hold it in place and give the fabric support while machine embroidering. We’re going to use them on front of the fabric as the actual pattern. Our choice of stabilizer for this technique is fusible tear-away stabilizer. How to: Cut a piece of fusible tear-away stabilizer at least 1’’ bigger all the way around than your embroidery hoop. With the fusible side down, trace your design onto the stabilizer. Preheat your fabric with the iron, then iron the stabilizer to the fabric. Place the fabric and stabilizer in your hoop (if needed) then stitch your design through both the fabric and stabilizer. To remove the stabilizer when you’re finished stitching, first remove any large pieces. Then gently remove the stabilizer around the edge of the stitches and around each individual stitch. If you accidentally loosen a stitch by pulling on it too much, tighten the stitch by pulling on it from the back of your embroidery. Embroidery is easier to manage when you use an embroidery hoop to hold your fabric in place. Loosen the screw closure of your hoop and separate the inner and outer hoops. Lay the inner hoop on a flat surface. Place your fabric on top of the inner hoop, making sure the fabric hangs over the inner hoop’s edge by at least 1’’ all the way around. Place the outer hoop on top of the fabric and press down over the inner hoop. Gently pull your fabric taut without separating the two hoops. Once your fabric is pulled evenly across the hoop, tighten the screw closure. Tip: When you’re finished stitching for the day, take your embroidery out of the hoop. Leaving it in the hoop for a long period of time can permanently crease your fabric. Look at your embroidery design and stitch and color guide, and decide where you would like to start your embroidery and what color of embroidery floss to use. Cut a piece of embroidery floss to about 24’’ in length. If you’re using 6 strand embroidery floss, divide the 6 strands in half to create 2 pieces of floss that have 3 strands in each piece. Typically to start your embroidery, bring your threaded needle from the back of your fabric through to the front, then start your first stitch. But how to stop the end of your floss from slipping through? Well, the simplest way is to just tie a knot at the end of the floss. However a knot on the back can often make a bump on the front of your embroidery that you don’t want. Also, if you’re embroidering something that will be washed, your knot can become untied. 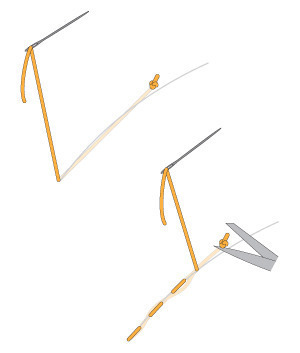 Two better options to secure the end of your floss involve making temporary knots. 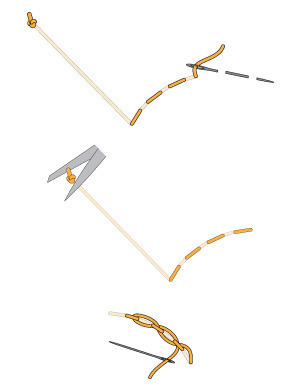 Below are the “away knot” and “waste knot” options. Tie a knot at the end of your floss. Bring your needle through the front of the fabric at least 5’’ away from where you want to start stitching. Bring your needle from the back of the fabric through the front where you would like to start your first stitch. Embroider your design leaving your knot in place. When you get to the end of the floss, turn your work over and weave in the end through the backs of your stitches (see “how to finish stitching” below). Snip away your starting knot. Thread the tail of floss through your needle and weave the end through the back of your stitches as you did with the other end of floss. Tie a knot at the end of your floss. Decide where your first line of stitches is going to go. Bring your needle through the front of the fabric about 2’’ along that line. Bring your needle from the back of the fabric through the front where you would like to start your first stitch. Start your embroidery. As you embroider towards your knot, make sure the backs of your stitches are going over the tail of your floss, securing the floss in place. Once you’ve secured the tail of the floss with several stitches, snip away the knot from the front of your embroidery. Continue with your embroidery. When you get to the end of the floss, turn your work over and weave in the end through the backs of your stitches. 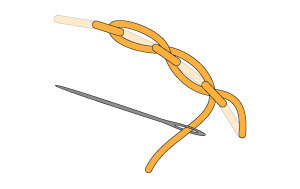 Weave the tail of your floss back and forth at least once each way to lock it in place. Trim the tail close to the stitches.